The Mongol lifestyle was built around horses, and for a Mongol warrior the horse was even more important. The Mongol horses provided everything to the nomadic Mongol people whose life was constantly on the move. Horses were used to travel, to hunt, to haul their belongings and their mobile homes the gers. It was even common for every Mongol warrior to own up to ten horses and sometimes even more, which displays just how important they were to everyday life. Not only was a horse likely a Mongols most trusted friend, they were a huge component in the success of the Mongol empire under the rule of Genghis Khan. Without the horse, the Mongols would never have attained the success they enjoyed, and of course we plan to delve into much more detail on how important the horses were to the Mongols. The Mongol horse was particularly hardy, suited perfectly to the Mongol steppe whicch was its dwelling and home. It was common for the Mongols to not interfere with horse breeding, which still stands to this day. This method of not intervening meant one thing, that only the strongest of the Mongol horses would survive, and they were suited perfectly to their environment. The Mongol horse was actually a very small horse, but often would be mistaken for a pony due to its diminutive height and stature. In reality the small Mongol horses were actually perfect for their riders. The Mongol people weren’t tall and the horses stature was an excellent fit, allowing an easy mount and dismount for them. 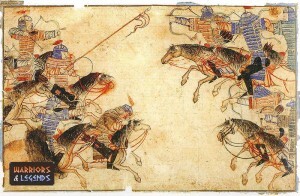 The short Mongol warrior horses were ideally suited to the Mongol style of combat. The Mongol horse as we mentioned earlier were and are very hardy and resilient creatures. The Mongol horses would have to survive in boiling temperatures in the summer and harsh cold and wind in the winter. Not only were the Mongol horses resilient to the weather, they were also capable or being ridden hard. Rumours go that Mongol warriors would ride their horse for up to 40 kilometres around 25 miles in just one day. As we’ve already mentioned the horse was an integral part of everyday life for a Mongol warrior. The Mongol horse was used for travel, to carry rider and belongings long distances. They were also used for communication from the Mongol stations known as yams. Not only this but the short Mongol horses were of course used by the Mongol archers to fire off volleys of arrows on the move, and also used by the Mongol heavy cavalry to fight in close, should they need too. The Mongol warrior horse was well adapted to the nomadic lifestyle of the Mongols. 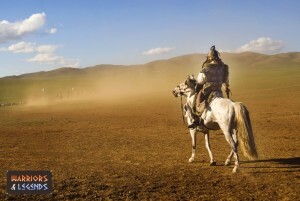 The legends tell of fantastic stories involving the Mongols and their horses. Many warriors believed that their life was tied to their horses, some warriors would state that without their horse there was no life. On long journeys in the steppe, lacking sustenance and nourishment for a rider, its told that a Mongol warrior could survive for days on only horse blood. Legend tells us that the Mongols would let blood from their horse to provide sustenance and this could keep a rider travelling for days with no food or water. It’s hard to underestimate exactly how integral to life were the Mongol horses. They provided much to the ancient Mongol people and their warriors and allowed them to thrive in their environment. Without the horse its unlikely the Mongol warriors would have been as successful in battle, in war, or even in their everyday life.